Just a couple beamshots of my new 405 I assembled today. And some fluorescent calcite glowing under a ton of UV. Forgot how much it blooms around the laser aperture. The massive bloom around the end of the beam is because it started vaporizing the plastic garbage can I used as a beamstop. Calcite being hit by the beam. Completely clipped out the exposure where the beam hits, but I like the way the crystals look and how the color changes as it radiates outward. This one was hard to do, but well worth it. 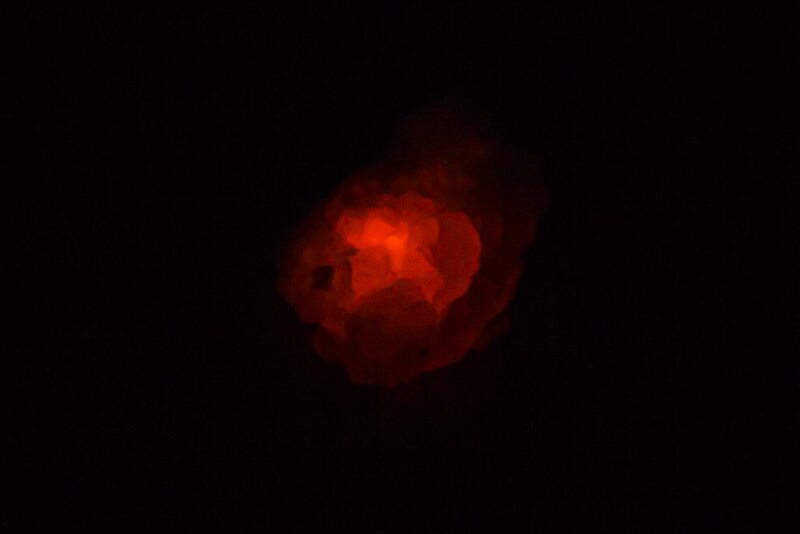 With lots of getting the timing right, I managed to turn the laser off just before the shutter opened, allowing my camera to capture the residual glow of the calcite, showing its natural orange fluorescence. Flourite can phosphorese too. Very nice to see this. 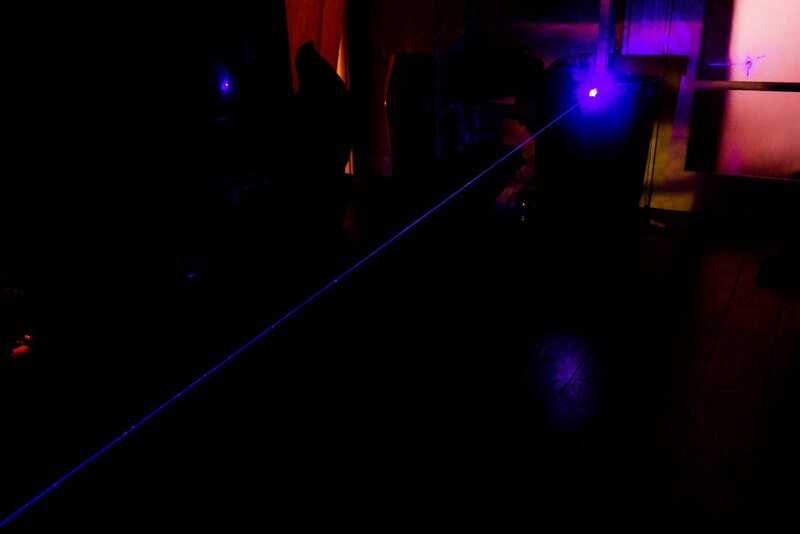 How long do you think the fluorescence lasts after turning off the laser? 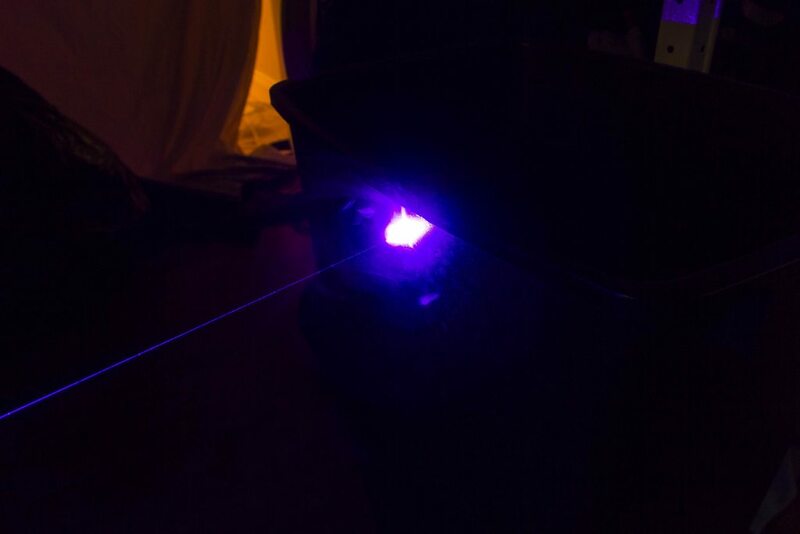 That is way cool, my 405 nm laser diode died some time back, haven't replaced it yet, but one of the things I liked about it was finding things which would produce fluorescence. A yellow kitchen rag we had would look almost white and light up the kitchen when I defocused the lens to put a wide spot on it, was really cool. Cool pics im gonna dig thru my rock crystal collection and see what kinda cool effects i can get out of em. Glad to see your build was a sucess compared to your last one, keep up the good work! A while back I started a topic how surprised I was to discover gypsum (drywall) and TIO2 (white paint) phosphorese. Both produce a milky white light. The fluorescence is very short lived after the UV source is removed. 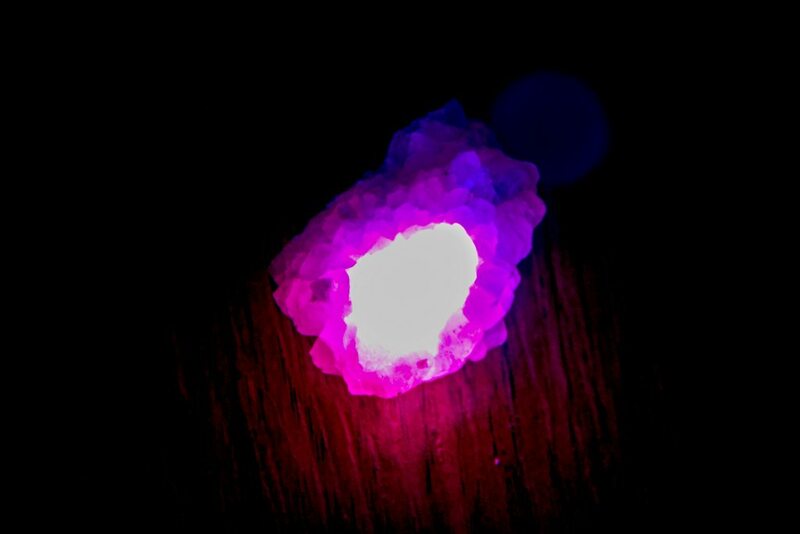 Hard to get an exact measurement, but it lasts no more than a second or so, and is barely perceivable by the naked eye, although the UV used to stimulate the crystal may also degrade low light sensitivity in the eye, making it harder to detect. Thanks, a second is short, but you got the photo anyway! Steve, I sure enjoyed how white a 405 nm laser can make some things appear too, was fun. 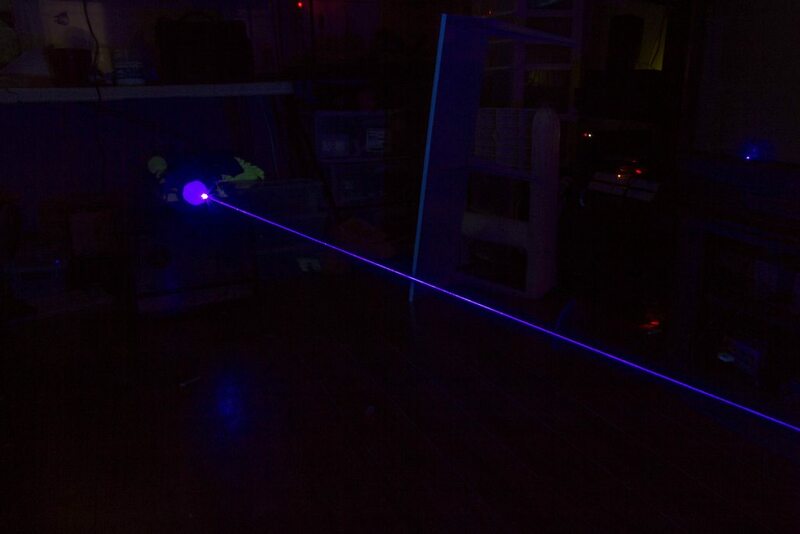 I will try the drywall when I get another 405 nm laser. Yes, shipping labels, many types of paper all fluoresce bright white. My calcite crystal is not fluorescent. Probably because it is mostly clear and refracts light, even 405nm light. Yeah my crystal is pretty much solid white all the way through. I actually got a good deal on it, the one I ordered was supposed to be 1" by .5" but the guy gave me this much bigger one for the same price as a new customer bonus. Also, I was playing around with the crystal and some of my other lasers, and it seems that both my 532 and 520 green lasers cause fluorescence in the crystal as well. Its much shorter lived though so it might be hard to document. 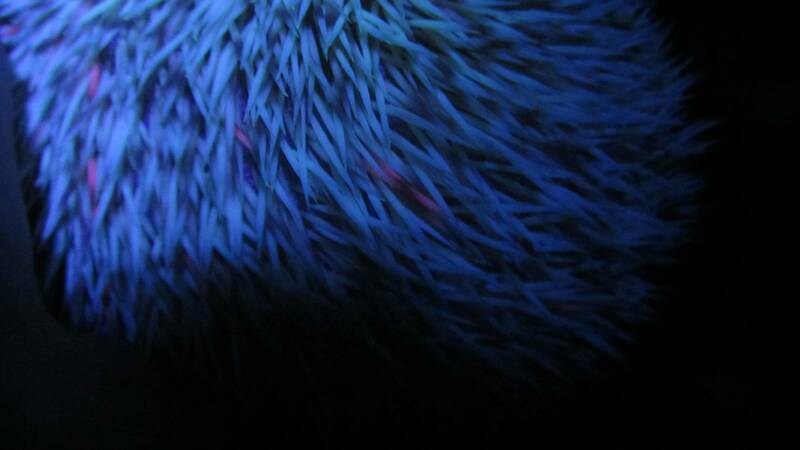 Thats a picture of my hedgehog I used to have under a UV light, and if you look carefully you can see some of the quills are fluorescing orange. I don't know for certain, but a couple experts I contacted hypothesized that the high calcium content in the quills combined with the high manganese content of hedgehog food may result in some of the quills forming fluorescent calcite. Bacteria can also fluoresce that color. This looks awesome lol. That's so interesting, regarding the orange quills. What a great accidental discovery when you think about it. your Global location in your Member Profile.